When your told you need a knee replacement there may be another option. Regenerative Medicine therapies like Stem Cell Therapy, and Platelet Rich Plasma (PRP) may be viable treatment options. Regenerative Medicine is a new emerging field that is rapidly expanding into many medical fields. In orthopedics and musculoskeletal medicine, Platelet Rich Plasma (PRP) and Stem Cell Therapy have seen a surge with elite athletes and in osteoarthritis of knee joints. The use of PRP and Stem Cell Therapy has included the hip, shoulder, wrist, ankle and spine. Knee replacements are recommended often when the treating Physician has no further options. As more awareness to Platelet Rich Plasma (PRP) and Stem Cell Therapy occur, more patients are considering these procedures as alternatives to knee replacement surgery. 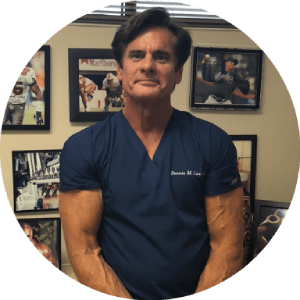 Dennis M. Lox, MD, a Sports Medicine and Regenerative specialist, has treated many patients who were told they needed a knee replacement, and were treated successfully with these therapies.